An astronaut aboard the International Space Station used an extraterrestrial remote control system on Friday to maneuver a robot rover at NASA’s Ames Research Center in Silicon Valley. In the test, Italian astronaut Luca Parmitano used the rover to deploy a simulated radio telescope antenna on the Ames Roverscape, a sandy and rocky simulation of the lunar landscape that’s about the size of a football field. 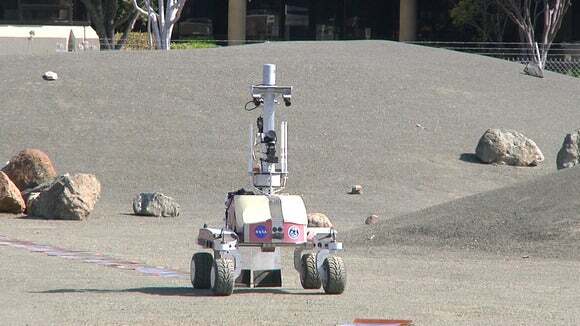 NASA’s K10 rover is seen during a test at the NASA Ames Roverscape. The test, one of a series, points to NASA’s latest thinking about lunar and planetary exploration. Whereas the Apollo astronauts did everything themselves and the Mars Rover has done its work autonomously, NASA is looking to a future where astronauts control nearby robots to carry out tasks. That can’t be done easily from Earth because of the long time it takes for radio signals to travel the vast distance to neighboring planets. In the case of Mars, there’s an eight-minute delay before a signal reaches the planet, and then an eight-minute return time for a confirmation signal. So while Friday’s test had an ISS astronaut controlling a rover in Silicon Valley, it simulated a future lunar mission with a spacecraft in an orbit between the moon and Earth. “We’ve chosen a mission scenario that involves taking a robot to the far side of the moon and deploying a radio telescope to observe the early history of the universe, the so-called cosmic dawn,” Fong said. Scientists are eyeing the moon’s far side as a location for a future radio telescope because the moon itself shields the location from radio interference being emitted from Earth. Radio and communications transmitters continuously blast out signals on the frequencies of interest to radio astronomers, so finding a spot with little radio noise is a challenge. After the moon, they estimate the next best location for low radio noise is beyond Jupiter. In the test, the simulated radio telescope antenna was made of a thin, plastic film that was stored on a roll inside the rover’s body. The rover drove to a pre-determined point and one end of the film would drop from the back. It then moved forward, unrolling the antenna onto the ground behind it as it drove. “The future is going to be an astronaut or a series of astronauts in control of a fleet of rovers, either if you’re on the surface of a planetary body like the moon or Mars or from orbit,” said Jack Burns, a professor at the University of Colorado and director of the lunar university network for astrophysics research.